Library Images for Illustration Purposes Only Please Refer to Photos for Product for Sale. 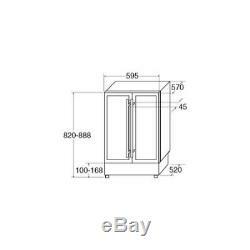 CDA FWC623SS 60cm St/Steel 40-Bottle Under Counter Double Door Wine Cooler. 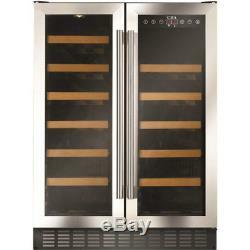 CDA FWC623SS 60cm Wide Freestanding Stainless Steel Under Counter Double Door Wine Cooler. Please Message Our Sales Team For More Information. Zone 1 (Bottles) - 20. Zone 2 (Bottles) - 20. Zone 1 (°C) - 22. Zone 1 (°C) - 5. Zone 2 (°C) - 22. Zone 2 (°C) - 5. Why this Product is Graded. Please Call for the Reason Why this Product is Graded tel: 01162 789 741 Condition: Brand New FRONT: No damage RIGHT SIDE: No damage LEFT SIDE: No damage TOP: No damage BACK: No damage HANDLES: No damage LEGS/FEET: N/A Water kit: N/A Fixing kit: N/A Upstand: N/A Comments: See Photos.... Please call for more information if required 01162 789741 - Some of our appliances don't come with user manuals but these can be downloaded off the internet. The Appliance Depot is one of the Uk's Leading graded appliance specialist retailers. We sell brand new graded appliances, so what does brand new graded mean? First of all products have NEVER been used. There are number of reasons that a product may be graded:- - It may not be in its original box or packing, or may even be just an end of line product. It may have been on shop floor display, ie ex display or ex demo! - It may have slight cosmetic marks which are usually to the sides or rear and occasionally to the front. PLEASE ENSURE YOU LET US KNOW YOUR TELEPHONE NUMBER! PARTY CARRIER AND SO WE CAN'T GUARANTEE THIS! D elivery charges can vary in certain parts of the UK, please see below if you are affected. VERY IMPORTANT : ALL DELIVERIES ARE DOOR TO DOOR ONLY AND WILL NOT BE TAKEN INTO THE HOUSE! OUR 3RD PARTY DRIVERS ARE NOT INSURED TO DO THIS! Our larger appliances are delivered on a large vehicle with a tail-lift, if your building has any access issues, ie narrow lane etc, you must inform us beforehand. We accept all major credit and debit cards apart from American Express. You are welcome to visit our 25,000 sq. If you are planning to view a particular product please check with us first to make sure will still have stock of that item. Leicester 10 minutes drive from Junction 21 of the M1 motorway. On the opposite side to our warehouse showroom, the address is as follows:- The Appliance Depot Countesthorpe Road South Wigston Leicester LE18 4PJ. Who are the Appliance Depot. We are one of the UK's leading retailer of brand new graded and ex-display domestic appliances. We are a family run business based in South Wigston , Leicester, with over 40 years of electrical retail experience. We have a number of sales staff who can offer in depth product knowledge , an IT specialist, 2 very experienced engineers, and a warehouse crew to manage and deliver the stock. We have 2 large warehouses with over 1000 items for sale and a total of 25,000 sq ft storage. We sell all large domestic appliances from fridge freezers to dishwashers, washing machines and tumble dryers, a large range of built in appliances from the most reputable manufacturers. This means the graded products we sell are priced substantially less than an equivalent brand new item. The item "CDA FWC623SS 60cm St/Steel 40-Bottle Under Counter Double Door Wine Cooler" is in sale since Tuesday, July 24, 2018. This item is in the category "Home, Furniture & DIY\Appliances\Fridges & Freezers\Wine Cabinets/Fridges". The seller is "profilevision" and is located in Leicester. This item can be shipped to United Kingdom.